One of the things I love in Boston is very close by to where I live. It's not technically in Boston; it's in Dedham. 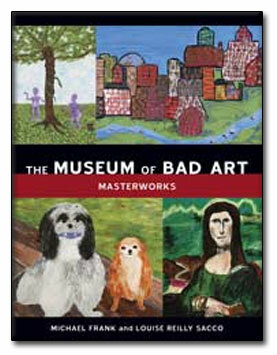 The Dedham Community Theatre houses one of Boston's best treasures: the Museum of Bad Art. The MOBA should not be confused with Boston's Museum of Fine Art (also a favorite place) but once you see the collection, there's no chance of confusion. Recently, WBUR, the local NPR station did a feature on the MOBA, which has now expanded to the Somerville Theatre as well. Both the Somerville and Dedham MOBAs are located in the lobby outside of the men's bathroom. Story at WBUR is here. Purchase the book (pictured above) here.